Penguins is a beautifully danced show that tells the story of two penguins living in a zoo. The only words in this almost non-verbal performance are those that occasionally drift across from unseen zoo visitors leaning over the fence and talking about the penguins clamber over and swimming around their enclosure. "Look at the penguins! Are they a couple?" 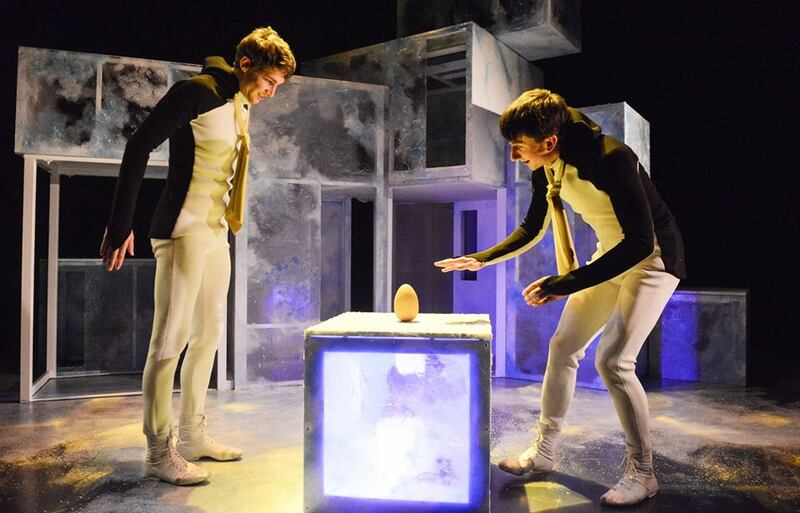 Choreographer Carlos Pons Guerra has equipped dancers Osian Meilir and Jack Webb with familiar gestures that draw the audience into the world of these two penguins which are allowed to have subtly distinct personalities. We watch them play, share meals, preen and enjoy each other's company as they jump over the boxed set and swim over the shimmering pool floor. As the 45 minute show progresses, we witness their disappointment when they realise that unlike all the other nests, there's doesn't have a white egg. Instead the stand astride a rock found in the pool, until a zoo keeper (Corey Annand) substitutes it for the real thing. The dramaturgy is as delicate and thrilling as the dancing, with coloured ties hinting at gender and the repetition of various movements providing the piece with shape as Roy and Silo nurture little Tango when she is born. Their faces beam with joy as they teach their new-born to move and swim. 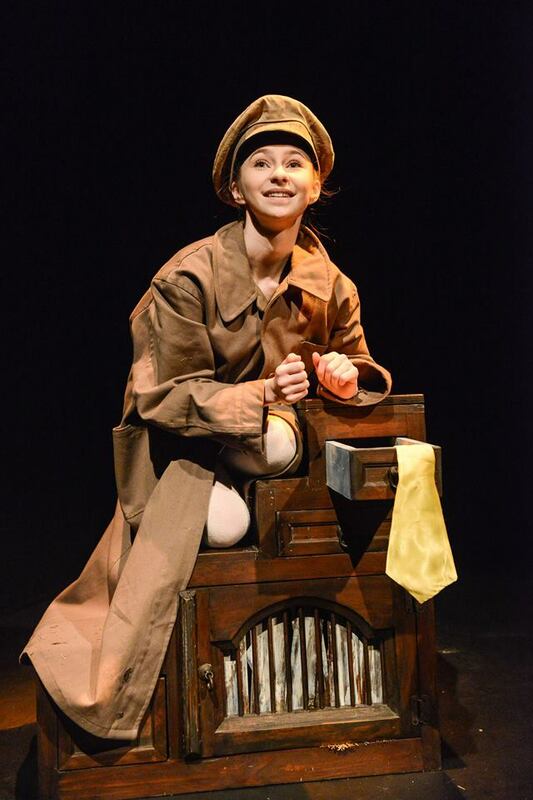 Co-produced by Cahoots NI with Birmingham Repertory Theatre and Prime Theatre, it should not be a surprise to find that some of the props have magical properties. The zoo keeper's little chest of drawers is the gift that keeps on giving, while there's even room for a signature Paul Bosco Mc Eneaney disappearing trick towards the end. Garth McConaghie's sound design uses a plucked strings, soft brass and percussive sounds to create light melodies that echo the playfulness of the two male penguins. The bright phrasing and repetition draws in the young audience - Penguins is pitched at three year olds and above - and adds to the charm of production. Sabine Dargent's playground set comes to life with Simon Bond's lighting design, with translucent panels hiding as much as they revel. Based on a real pair of penguins* the show explores themes of friendship, family, nurture and acceptance in a very gentle manner. With several shows in development and out on tour each year, Cahoots NI's reputation justifiably stretches far from their base in Belfast. And the Penguins will surely swim further afield and feed off appreciative audiences in warmer climes in the months and years ahead. 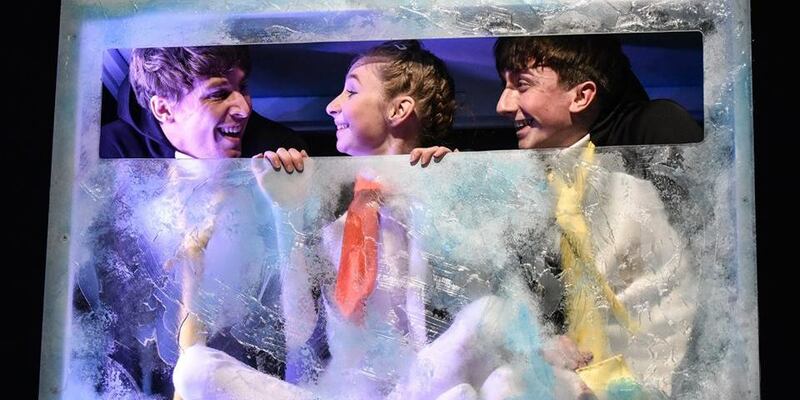 Limited tickets are available for the two performances of Penguins on Sunday 11 March. The final performance during Belfast Children's Festival is on Wednesday 14 March before the production continues on its UK and Ireland tour through Limavady, Armagh, Dundalk, Castleblayney, Navan, Roscommon, Blanchardstown, Dublin, Salisbury, Bournemouth, Swindon, Bath (in the appropriately-named 'The egg' venue) and Bolton.